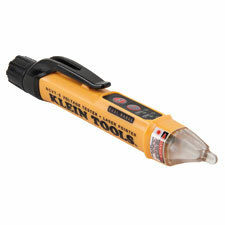 August 28, 2018 (Lincolnshire, Ill.) – Klein Tools (www.kleintools.com), for professionals since 1857, introduces the Dual-Range Non-Contact Voltage Tester with Laser Pointer (Cat. No. NCVT-5) and the 200A AC Open Jaw Fork Meter (Cat. No. CL360), which augment Klein Tool’s existing test and measurement product line with innovative capabilities. The NCVT-5 not only detects AC voltage but also can be used to identify objects of interest at a distance using the integrated laser pointer. The CL360 features a wide jaw to make measuring current in thicker cables possible. This line extension offers new solutions to measuring common electrical parameters.